Armillary dial with horizon ring 4 ft. 4.5 in. diameter designed by Ken Lynch. Dial is made of brass and horizon ring has signs of the zodiac on it. Mounted at ground level with a separate plaque with Equation of Time. After the dial was installed the university ordered the point on the end of the gnomon sawed off. It was feared that someone might become impaled on it. Gift of Harvy S. Kieval, Professor Emeritus - Math. A bronze armillary sphere dial on a quarried stone pedestal. The equatorial ring includes hour lines with 15-minute marks and Roman numerals. At the edge of the bay is a round horizontal sundial about 10 feet in diameter with a stark triangular gnomon. Both gnomon and dial base are of hammered concrete. The base rises above the ground by about 2 feet where Arabic numbers encircle the dial to tell the hours. The dial face is not quite level, perhaps to help with water runoff. A simple 12 inch diameter equatorial ring dial of rusted steel on a cast iron base bolted to a brick floor. This replacement dial has Arabic numerals and the base has Zodiacal symbols. The original "Sundial Lodge" was renovated as a boutique hotel but during the construction the original horizontal dial was lost. The original horizontal dial was about 16 in. 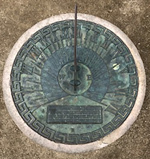 diameter, made of bronze with a circular plate with Roman numerals on a plain concrete column and displayed the inscription, "Count none but the sunny hours." Located near the edge of a hill in Culver Park, this dial commands a fine view of the surrounding communities. 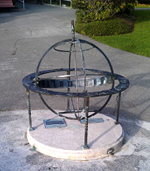 The equatorial dial face is a six foot diameter, six inch thick brass ring supported by a 24 foot long steel gnomon six inches in diameter. The gnomon is anchored in a concrete oval-shaped base covered with tile and mosaics. The base and three surrounding water-drop shape ovals are inscribed with the word "Time" in the 12 languages spoken in Culver City. Ballona Creek, visible from the sundial, once provided transportation, food and recreation for a thriving native American population and later for Spanish-origin ranch owners. The dial north face has the 1:00 hour line at the bottom for Daylight Savings Time while the south face has the 12:00 hour line at the bottom for standard time. A bronze plaque states time is read from the center of the gnomon shadow and briefly discusses the equation of time. The dial is not longitude corrected and indicates local apparent time. This 18-inch cast bronze horizontal dial is located in front of Heritage House, the relocated office and home of early Fullerton physician Dr. George C. Clark. The gnomon edge is tapered to a single style. Dial sits atop a cylindrical cast concrete pedestal 28-inches high. A 5 foot diameter steel armillary sphere with 6 foot gnomon rod. Inner surface of equatorial ring has cast Roman numerals; outer surface has cast Zodiac signs colored gold. 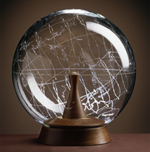 Sphere is supported by 13 inch high four-flange base. Dial sits on a 42 inch high cast concrete cylindrical base. The bronze equatorial dial is about 24" diameter, and has equatorial, meridian and horizon rings. It sits on top of a stone pedestal. The equatorial ring is supported by 24 spokes, spaced at 15 degrees. Around the rim 24 hour numerals in Arabic. The twelve signs of the zodiac are spaced every other hour on the equatorial rim. The orientation to true north and inclination were verified to be correct for the site. 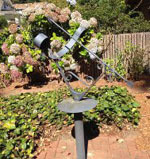 The sundial was a gift from the Kresser Smith family to the Descanso Gardens Guild in 1987 on the occasion of the guild's 30th anniversary. A sundial sculpture by Martha Oathout Ayers. More information about this dial is needed. A bronze-faced meridian arc dial 18 feet long, 13.5 feet high and 7 inch wide. Displays the meridian line and is inscribed with month and day markings, seasonal and lunar indicators and constellation figures. An overhead lens projects a solar image on the inscriptions. A large adjacent symbol is positioned to indicate which set of date markings is to be read from the meridian line. In a modern twist, photoelectric sensors embedded in the face of the arc are activated by the transiting spot of sunlight and send a signal to illuminate LED indicators on the 22 foot wide stainless steel ecliptic chart overhead, lighting up the stars of the constellation through which the sun is passing. Bronze sundial sculpture by Robert Paine. The sundial was donated to University High School in 1927 by Sara Bard Field in honor of her son Albert, who was killed in 1917 in an automobile accident. Albert was the high school senior class president in 1917. His mother Sara was a leading suffragist on the West Coast. The High School has been renovated and now used by Children's Hospital Oakland Research Institute (CHORI). The sculpture is of a boy holding a shield and an arrow. The arrow casts a graceful shadow onto the level shield. The sculpture is about 30 inches high. The base is stone, probably a jade. One of Bill Gottesman's unique-design Renaissance dials of cast and structural bronze with a 27 inch diameter helix with a celestial-north aligned axis. Time is told by a focused beam of light that moves around the helix throughout the day. The light beam is reflected from a long cylindrical unsilvered mirror in a structure that supports the helix. A sliding time scale within the helix can be adjusted for EOT and DST and includes longitude correction. Once this scale is adjusted for date, the dial shows civil, or clock, time. The dial base is cast bronze allowing adjustment for latitude and placed on a concrete pedestal. Large horizontal dial, with steel gnomon 22 ft. long, 14 ft. high. It looks like a sculpture of three interlocking triangles. The triangles of 2-inch thick Cor-Ten steel plates create the dial's gnomon and supporting structure. The dial sits in a courtyard where the only hour markers are placed on the lawn and brick patio around the dial. EOT values for every 5 days are shown on the north face of the support. This horizontal bronze dial is 14.5 inches in diameter, mounted on a fluted pedestal. The gnomon angle is set for the latitude and is 5 5/8 inches tall. Graceful hour lines extend from 5am to 7pm marked by Roman numerals. It is delineated only with half-hour lines. Surrounding the dial face is a zig-zag decoration. A 14x8 foot analemmatic dial with an 8x2 foot gnomon-positioning calendar plinth. The dial is installed in the pebble and concrete patio of the Winnett Student Center. The hour markers and calendar line plinth are made of Granodiorite of Knowles, a muscovite-bearing biotite granodiorite rock quarried from Knowles Quarry at Raymond, California. A nearby wall plaque provides longitude and EOT correction. The dial is a gift from the Caltech Alumni Association as a sculpture, a public artwork and a scientific instrument. This dial is located on the private university campus but the public may walk on the campus grounds to view the dial. Equatorial dial designed by Russ Busher. A semicircle of metal, pierced with numerals. Sun shines through numerals onto metal plate with vertical line mounted below. Semicircle in equatorial plane, plate in polar plane. Such a dial is frequently advertized in "Wind and Weather" catalog. Placed atop a wooden post. 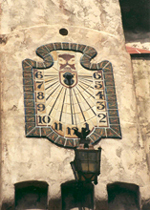 A 60x40 foot vertical dial of stucco, wood and brass, filling the south exterior wall of the building. Roman hour numerals show PST; Arabic hour numerals show PDT. Summer and winter solstice and the equinox lines are shown; the shadow of a nodus on the gnomon indicates the date. Dr. Nordgren explains that the shadow of the 10-inch diameter nodus "is just the right size to take into account periods when sundials are fast or slow relative to clock time. When dials run their slowest, the leading edge of the nodus shadow gives the accurate time. During periods when dials run their fastest the trailing edge gives the accurate time." Dr. Nordgren was among the seven designers of the sundials used on the NASA Mars Rovers in 2004. A 20x15 foot axis analemmatic dial built of cement hour posts, metal markers and tile and lava rock on the high desert floor outside the museum building. This vertical dial has undergone a number of restorations since it was set in lime in 1889. A photograph from 1900 shows the placement of a gnomon rod is horizontal. In 1992 before the National Park Service restoration in 2012 the gnomon is set in a polar orientation. But it doesn't really matter since the hour lines are marked at nearly regular 15 degree intervals with half hour sub-marks. This is a vertical obelisk 3 foot on a side and 9 foot tall. It is more of a sun calendar than a sundial. The tip of the obelisk's shadow is tracked by marks on a concrete pad on the ground. The summer and winter solstices and equinoxes are indicated by tiles set in the pad. A horizontal dial of welded steel plate using weld bead for hour lines and numerals. Marked for PST. A 5-foot equatorial sundial with elegant time and meridian supporting arcs. The gnomon A 5 ft. aluminum polar dial. The gnomon has the profile of the Golden Gate Bridge. Time is marked in both standard and daylight saving time with Roman numerals. The dial was a gift from Vallejo's Sister city, Akashi, Japan. A 15 inch diameter well-patinaed horizontal bronze dial on a stone pillar. This dial was designed for a different location. The hour lines are cut for 50? N; the gnomon angle is 46.5? and is miss-located on the dial face.